Michael Strahan did his thing on Jimmy Kimmel Live. 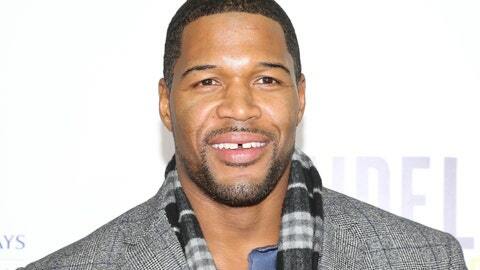 Michael Strahan will soon be a football immortal, so it only makes sense that his most famous feature comes with him. The New York Giants legend and FOX NFL Sunday host was elected to the Pro Football Hall of Fame in February and he said he wants his gap-toothed smile to be on his bust. "You go in and they measure your head," Strahan said on Friday night on Jimmy Kimmel Live. "I have to meet with the guy, because I think I want mine to be smiling. Most Hall of Fame busts — which are made out of bronze — feature the inductee with his mouth closed, possibly to convey a sense of toughness. But Strahan isn’t worried about it. In fact, he feels that a nice wide smile is more intimidating.